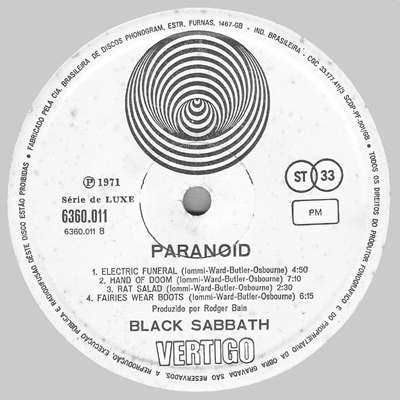 Brazilian Vertigo released quite some British albums with a swirl label. Slight differences to the covers were being made. Some few examples thereof may be found below. Fold-out covers and other extras were in most cases abandoned. 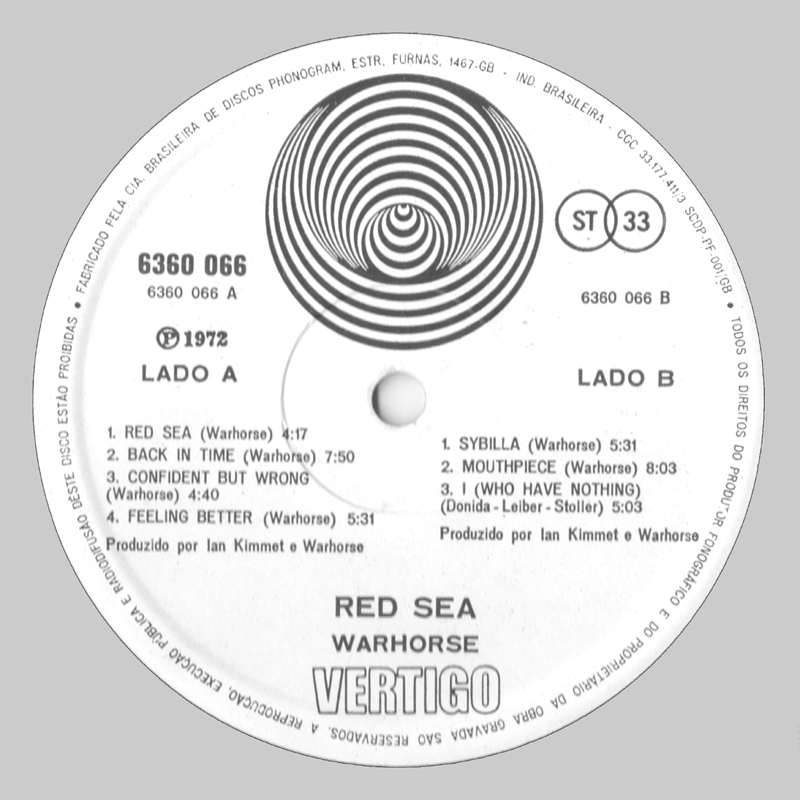 Early releases did not yet adopt the practice of the full swirl logo on the A-side, but divided the information over both sides. Later issues did correct this. 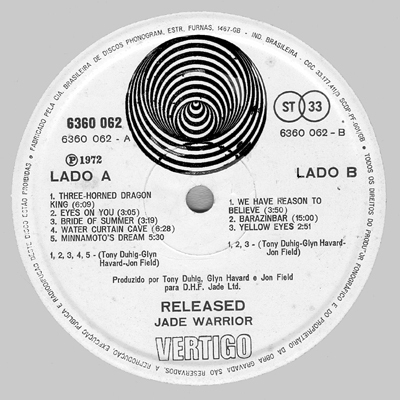 On those later releases the first white circle contained ''Vertigo'', the second stated ''lado A'', similar to Argentina. Matrix numbers were hand-etched and showed the country pressing code for Brazil, 200, alongside the catalogue number and the side. 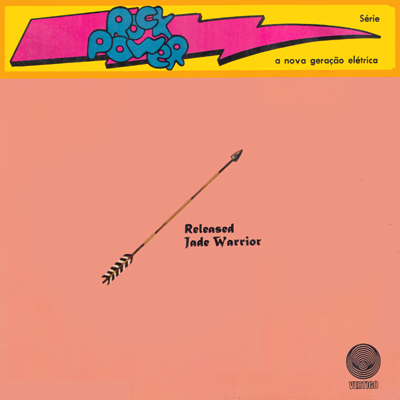 There was at least one (maybe more) sampler issued, unique to Brazil. Brazilian backcover for 6360 011. First Brazilian label with info of one side only. The contents are the same as on the British counterpart, but the fold-out cover was reduced to a single one that sported a photograph on the back not used with the British release (see scan above). The front cover was identical to Britain, though pretty badly reproduced. At 1 o'clock , the wording ''Ind. Brasileira'' clearly defined the country of origin. Second Brazilian label with info of both sides on the B-side. The cover design followed the British one, but discarded the gatefold. The information was therefore transferred to the backcover in a new font. Musically identical to the British release. The poster cover was deemed too much and the same simplification (more or less) as with the German cover was applied. Contrary to that release, there was no poster issued. 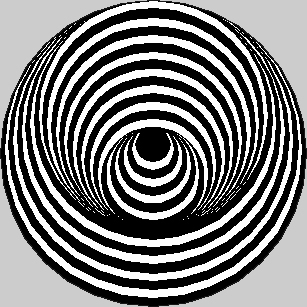 A most unattractive bar was inserted uppermost, part of a ''rock power'' program to convince potential buyers. On the backcover one of the six original panels was used, including all lyrics. Has been spotted, but we do not know the differences yet. Again the same contents as with its British counterpart. This time the six-part fold-out poster was reduced to a single cover, with the topmost panels (logically) providing the image. The title was tranferred from the bottom of the UK issue to a location underneath the band name. Participating bands - see track listing. 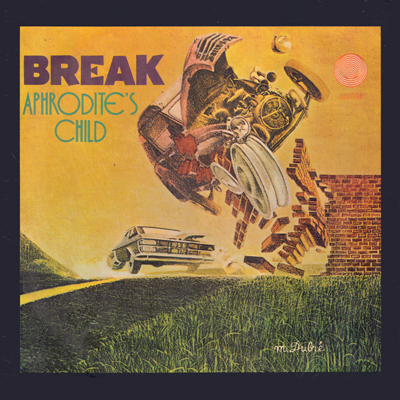 Track listing A-side: Ride The Sky (Lucifer's Friend)/ Hard Rain Fallin' (Sir Lord Baltimore)/ Telephone Girl (Assagai)/ Wholesale Love (Buddy Miles)/ Damn Fool (Exuma)/ Pilot (Blue Cheer)/ Run Baby Run (Hotlegs)/ Lady In Black (Uriah Heep)/ We're So Much In Love (Madeleine Bell)/ Jakaranda (Lally Stott) totalling 18'15'' . Track listing B-side: Thinking Of My Life (Juicy Lucy)/ Paranoid (Black Sabbath)/ St.Louis (Warhorse)/ Life (Legend)/ Don't Leave Me Now (Jimmy Campbell)/ Fire Queen (May Blitz)/ No Time Like The Present (Bob Downes)/ The Kettle (Colosseum)/ Sarabande (Beggar's Opera) totalling 17' 25''. The Vertigo logo on front is very pink. Not only because of its, well, catchy cover and not only because of the fact that an avalanche of artists otherwise not known to record for the label makes its appearance, is this a remarkable sampler. The musical contents are also pretty unique. The bosses have edited each track to fit into the next one, thereby creating an unsettling suite of totally disparate shreds of music, that sometimes works very well, but most of the time leaves the listener completely bewildered. An obscure rarity for sure. The cover is destined to be a seventies prototype, albeit not a very creative one. The abstractions at the bottom right are incomprehensible and the lady is your home-made pop-art icon translated into a seventies idiom. Oh wait, it's a comic strip figure, actually. The backcover is of singular interest: no less than 12 samplers in this vein are depicted, all in black and white, unfortunately. Two of these (Jazz Baby Jazz and Cool Baby Cool) even have a label logo on front, respectively Verve and Reprise. 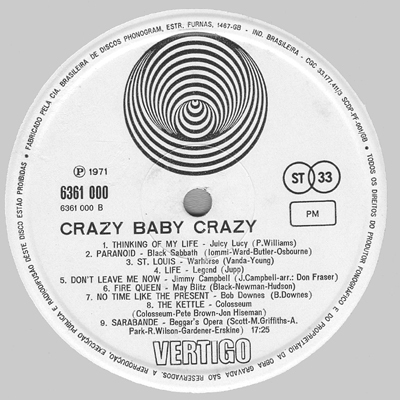 Also quite tantalizing is the inner sleeve around our copy, as it gives us the line-up for a sampler like ''Underground baby'', which among others boasts Bert Sommer and The Road. 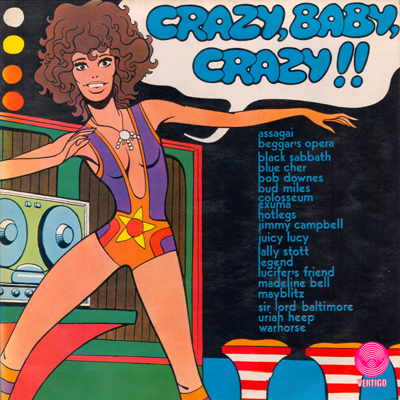 Groove Baby Groove even has The Beatles, The Who and Web alongside Shocking Blue and Charlie Brown and many others. Strange fare altogether! Notes: ''Blue Cheer'' is misspelled on the front cover as ''Blue Cher''. A wink towards Sonny Bono? 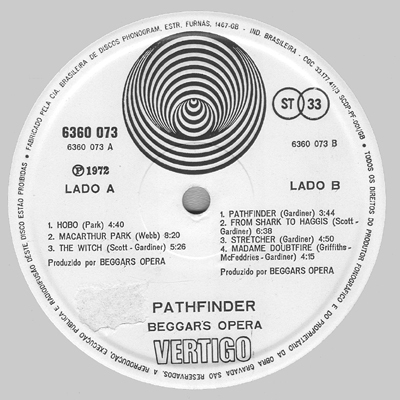 Line-up: Silver Koulouris, gtr, perc/ Vangelis Papathanassiou, keyb, fl, vibr, perc/ Demis Roussos, voc, bsgtr/ Lucas Sideras, voc, dr.
Cover manufactured by Matiz Gráfica e Editôra Ltda..
Track listing A-side: Babylon (2:52)/ The Four Horsemen (6:10)/ The Lamb (4:40)/ Aegian Sea (5:24)/ The Beast (2:23). 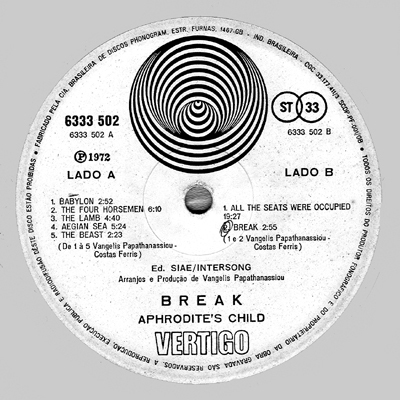 Track listing B-side: All The Seats Were Occupied (19:27)/ Break (2:55). All tracks by Vangelis Papathanassiou + Costas Ferris. Instead of the slightly sprawling double album the UK was treated with, Brazilian Vertigo opted for a somewhat lighter version, a single album, carefully put together from the orginal issue. 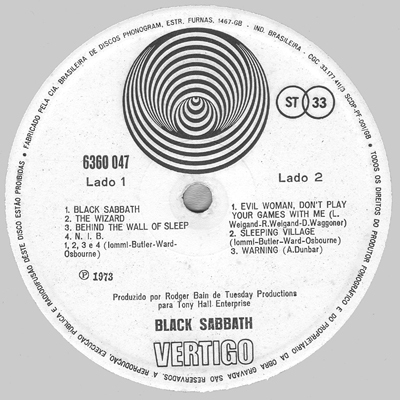 The title ''666'' was substituted, the album was now labelled ''Break'', the A-side of the single released simultaneously. This and the B-side of the single bookend a rather sobered apocalypsis. Though we may miss some of the best tracks, notably The wedding of the lamb, it was certainly more on the safe side to release this without Irene Papas' orgiastic vocal solo. But the B-side is laudably similar to the counterpart's D-side, a wise choice in our eyes. 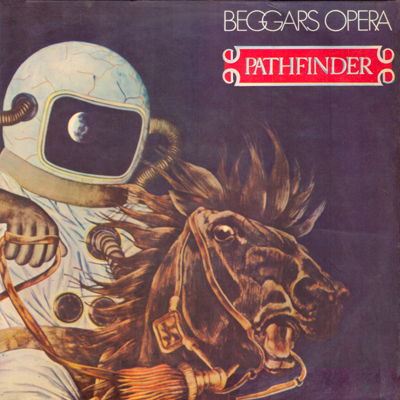 The sinister artwork from the inside of the UK release here served as the front. The backcover is pitch black with the sparse credits. It's a single cover, of course. 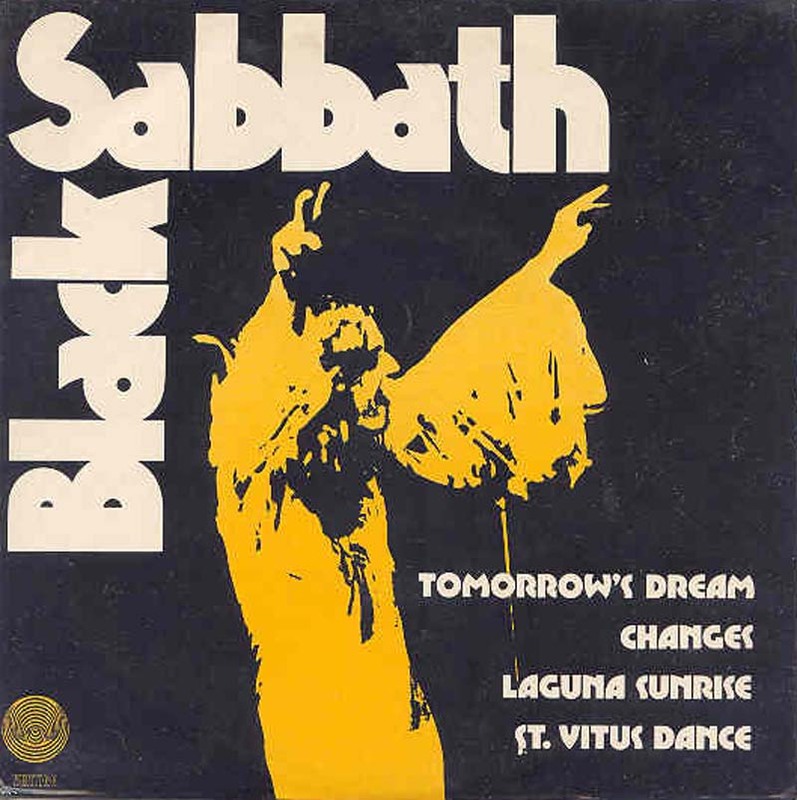 Brazilian picture sleeve for 6276 008, Black Sabbath Tomorrows dream/ Laguna sunrise/ Changes/ St.Vitus dance. 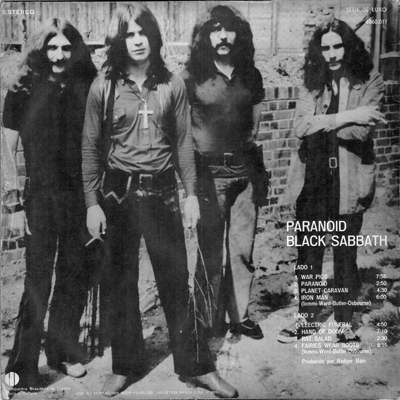 Brazilian picture sleeve for 6299 003, Black Sabbath Sabbath bloody sabbath/ Rat salad/ Fluff/ Paranoid.